It's official: Kellyanne Conway won't be Donald Trump's press secretary. 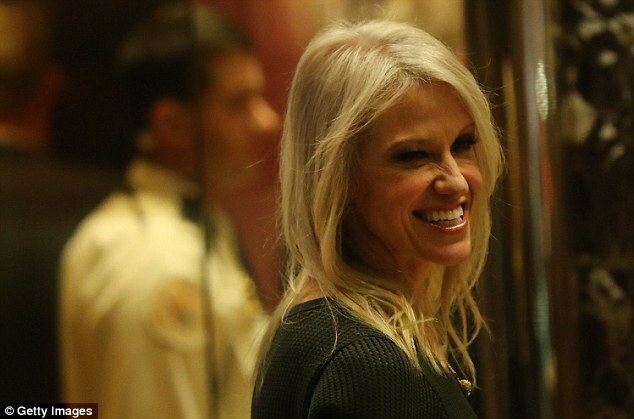 Conway told conservative radio host Hugh Hewitt on Monday that she won't serve as the Trump administration's top spokesperson. The former Trump campaign manager and now senior adviser had hinted before that she might not work with the incoming administration and confirmed for the first time yesterday that she has 'politely declined' the role of press secretary. Conway added: 'I think it’s an incredibly important position to fill. And I know that there will be a qualified man or woman who takes that position and does an excellent job for President Trump and Vice President Pence. Conway, who ran the Trump campaign in its final months, was a favorite for the high-profile job. In November, it was reported that the president-elect offered Conway the choice of press secretary or communications director, but that she preferred to remain in an outside adviser role. She has been open about her reluctance to take a job inside the White House. Earlier this month she tweeted that Trump will need a 'superstructure like the one [David] Plouffe built'. Plouffe crafted President Obama's winning White House strategies and shied away from serving in his administration. Speaking at POLITICO's Women Rule Summit last week, Conway said that as a mother of four taking a White House position is a 'bad idea, bad idea, bad idea, bad idea'. She said: '[I]n terms of going into the West Wing, I will do whatever the president-elect and the vice president-elect - I worked with Mike Pence for 10 years - they believe is my best and highest use for them. Conway became manager of Trump's campaign in August, then steered him to an improbable win. Trump hasn't announced who will be his press secretary, but a few people have raised their hands: Trump's communications director Jason Miller, the Republican National Committee’s communications director Sean Spicer and radio host Laura Ingraham, who has also served the president-elect as an informal adviser.